This is the resting place of Rosendo Dorame – an amazing member of both the IWW and the PLM. It is men like this that we must always remember. Rosendo A. Dorame (1879-1932) was a Mexican Wobbly as well as a member of the Mexican Liberal Party (PLM.) His family originated from Sonora, Mexico but later moved to Florence, Arizona. He worked in several various occupations – barber, miner, carpenter and even briefly as a sheriff in Arizona. He joined the Western Federation of Miners and participated in the Colorado Cripple Creek miner’s strike, which lasted from 1903 to 1905. 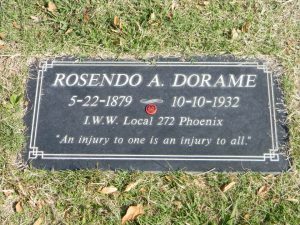 Dorame actually helped form the Phoenix IWW local 272 in 1906. Three years later he assisted in the creation of the La Union Industrial, the only Spanish paper in the U.S. advocating industrial unionism. 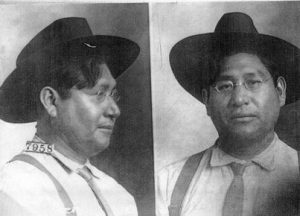 In 1911, he recruited Mexican men from mining camps in Arizona and led one of the arms of the PLM invasion into Mexico. He was arrested and convicted on violating the neutrality law and spent one year in prison. After his release he organized a smelter strike in El Paso with another IWW-PLM member, Fernando Palomares. He also took part in the 1917 Bisbee, Arizona copper strike where he was a victim of the great deportation. Sometime before 1920, he moved to Southern California and continued to raise his family until 1932, when he passed. His gravesite can be found at Evergreen Cemetery.